New Pet Joker Jack Brings You Endless Joys! Do you see a clown appear in Sapphire lately? 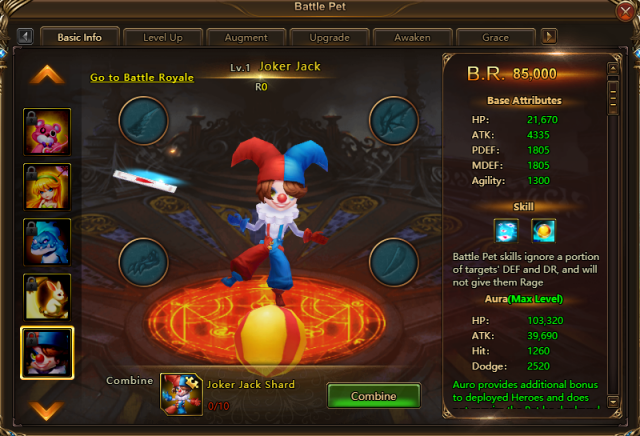 Yes, it is League of Angels II's newest Battle Pet-- Joker Jack. Joker Jack is a cheerful clown that got lost from his circus. He becomes happy again for he has met so many warriors who are very kind to him. Except for his special ability to amuse others, he is also a good helper in battle. Let’s see how helpful it is! Deal (294%+10960) DMG to all enemies plus an additional 50% DMG to the target with the lowest HP percentage; reduce DEF of all enemies by 15% for 2 rounds. Deal (230%+8580) DMG to all enemies. Take Joker Jack into your squad and it will show you how powerful it can be! Participate in the Single-Server Resource Tycoon from Nov. 26th to Nov. 30th. Accumulate specific Tycoon points and he will be yours! Stay tuned for more great news and events! Last：Wear New Suit Winter Angel and Dance in the Snow! Next：Black Friday Special: Enjoy the Brand-new Event and Get the Best Deal!